This is the time of year where many of us do Spring Cleaning around our homes so we can get out and play to enjoy our beautiful Alaskan summer! (Very soon!) It’s when we go through closets, cupboards and drawers and start getting rid of things we no longer need. It’s also a good time to do a very thorough, deep cleaning of your entire home. If you want a very thorough cleaning & your time is too valuable to spend on cleaning tasks such as cleaning your tile, carpet, area rugs & upholstery….then you should seriously think of hiring a professional like TCM Restoration to help you with your Spring Cleaning. Clean carpets, upholstery, draperies and even your mattress. Clean oven, refrigerator and other appliances. Wash inside & outside of windows. Clean out cupboards and closets. Dust & clean baseboards, doorways, etc. When you are cleaning…clean efficiently. Avoid going back and forth around a room. Instead, work using a systematic approach. Think in terms of left to right, top to bottom. Begin with ceilings and walls, and work your way down to windows and furniture, finishing with the floors. Hire cleaning service providers. For those tasks that require a specialist (i.e. carpet, upholstery and hard flooring cleaning), hire only certified professionals. Before hiring anyone, confirm that they are trained and certified in the type of work to be performed, informally interview the company representative or technician, obtain a written estimate of the work to be completed and receive a written contract or invoice confirming the total price and any statements or guarantees. Hope you find these tips very helpful! 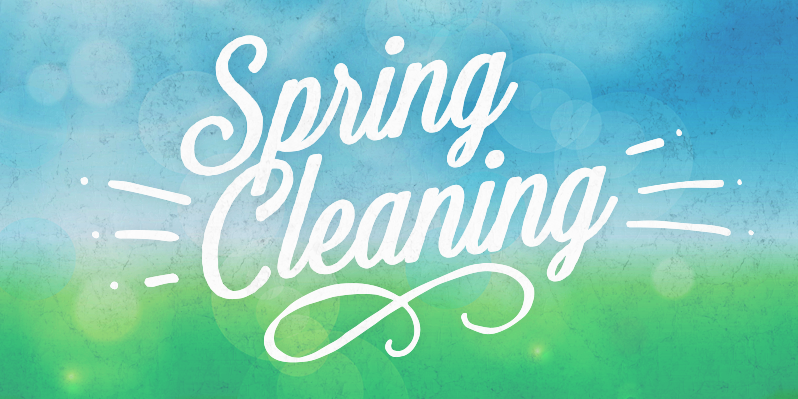 Happy Spring Cleaning! !